Firstly, a big thanks to everyone who voted, especially those of you who ran a well organised campaign this year. 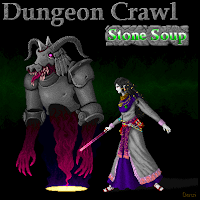 Dungeon Crawl Stone Soup had a bumper year in 2008, going from version 0.3.4, released on the 1st of January, through to version 0.4.4, as well as a playable beta of the near-mythical 0.5.0 being available for those brave enough to download it. This year also saw the inaugral Dungeon Crawl Stone Soup tournament in August, which featured feats of both individual and clan based play on two hosts, as well as a shake out a number of bugs in the 0.4.x line. Four hundred people total entered, showing how active and lively the Crawl community is, and testament to the addictiveness of roguelikes in general. Dungeon Crawl Stone Soup has established itself as a well-rounded, tactically rich roguelike, rewarding intelligent game play over mindless hacking. It deserves to be acknowledged in the canon of great roguelikes alongside NetHack, Angband and Rogue itself. To find out more about Dungeon Crawl Stone Soup, you should start with at the home page. I strongly recommend downloading the windows tile version as the best way to get into the game to start with. If you don't mind being spoiled, John Harris' excellent Before Learning to Walk, One Must Crawl is a good outline of the game play and tactics available to you. The best place for discussion I could find was the rec.games.roguelike.misc group, but if there's a better one, let me know and I'll publicise it here. This is great news! DCSS is easily one of the best games out there and really exemplifies the best of the roguelike genre. The best place for crawl discussion is on the IRC crawl channel, ##crawl on freenode. Do people still use IRC?